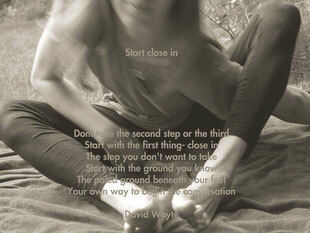 then start moving from within. In our fast-paced society many people experience problems with digesting all the sensory information that they encounter on a daily basis. Consequently they feel stuck or blocked, and find it hard to focus and rest. While practicing yoga improves physical fitness, flexibility and balance it also helps to reduce stress, depression, and anxiety. My teaching blends an alignment-based flow practice with Kundalini and yin yoga sequences to enhance and balance the flow of energy in the meridian and organ systems. 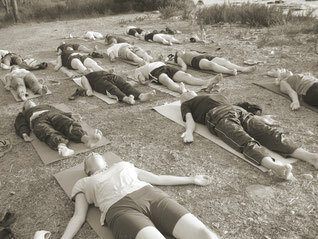 Meditation and breath practice are integrated to help remove mental and emotional tension. All these aspects help us bring together the elements within ourselves that often get fragmented in our everyday busy lives. Practicing yoga together with others is about having fun instead of competing with each other. We open our hearts and create more space in our bodies and minds, so that we feel balanced and light, yet grounded. There are many ways that you can benefit from a personal yoga class. Maybe you are new to yoga or have recently had an injury or surgery. You might find it hard to keep up with the pace in a regular yoga class or simply want to understand how to best align in a particular asana. Perhaps you would like to find out more about how to breathe and how different types of breath practice affect you; or deep relaxation, de-stressing and de-toxing could be at the forefront of your mind. You might want to start meditating or make meditation part of your daily practice. All of the above and more can be addressed during a personal yoga session. You have my undivided attention, knowledge and experience to provide a tailor-made solution to meet your needs on that particular day and to help you keep up the practice. As you learn how to bring mind, body, and spirit together, you get better access to your intuitive core and inner wisdom, which help you make decisions that are conducive to your growth and well-being. and allows you to slow down and focus attention on what is going on your body. As circulation is enhanced within the joints and the muscles are elongated, swelling decreases and the immune system is strengthened. Breath-work helps to release physical, emotional and mental tension and is a good preparatory tool for labour during contractions. Whether you choose to join a group class or come to a personal session, you will experience an improved sense of balance and flow.